Bright ideas. Bright partnerships. Bright opportunities. Since 2009, Bright Buffalo Niagara has celebrated, recognized and engaged with innovators in the region. We have created connections that help startups grow faster and prosper, and expand networks that break barriers. 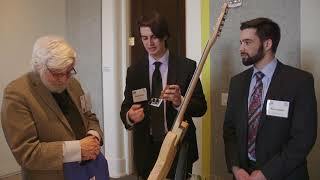 More than 100 high-tech companies have pitched their ideas to investors at our annual events, gaining valuable exposure to Buffalo's entrepreneurial ecosystem. Bright Buffalo Niagara participants have raised more than $40 million in funding. "The most impressive funding event that I have attended. Very well organized with the appropriate diversity of investors and customers." - 2014 Meet-Up participant. We are proud to promote investment, business partnering, and other entrepreneurial services across the tech, life sciences, energy, IT, and advanced manufacturing sectors in Western New York. Successful companies that have presented at our annual entrepreneur expo include Empire Genomics, Athenex (formerly Kinex Pharmaceuticals), and PostProcess Technologies.